During the last few days of our week-long vacation in Goa, we ventured out for some sight-seeing and shopping. 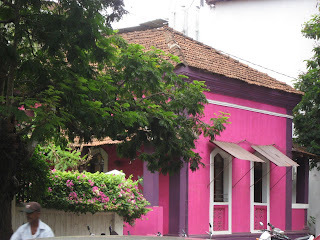 The capital city, Panjim (or Panaji) is almost an hour's drive from the hotel. Like always, I enjoyed the drive through green country-sides and fishing villages, along the sea and winding rivers. 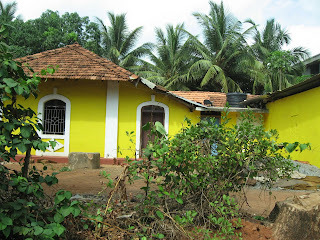 We watched brightly colored houses go past, many of which still have a distinct Mediterranean touch from Goa's Portuguese past. In the late 15th century, Vasco Da Gama became the first European to set foot in India. 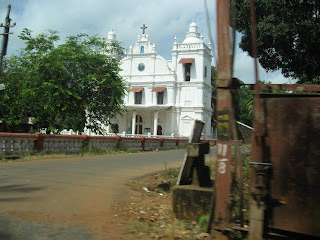 He first landed in Calicut followed by an arrival in Old Goa. The Portuguese arrived here with the intention of getting control of the lucrative spice trade and ended up setting up a permanent settlement. Goa became part of India well after India gained independence from the British in 1947. It was only after the Indian Army wrested the colony in 1961 from Portugal that Goa became part of our nation again. 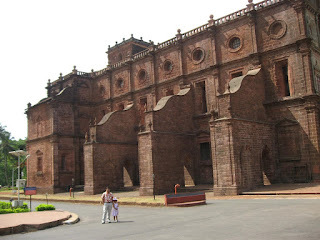 We headed straight for the Basilica of Bom Jesus in Goa. Built in the late 17th century, this cathedral houses the body of St. Francis Xavier which attracts thousands of Christians every year, especially during the public viewing of the body every 10 years. We then drove down to nearby Panjim and luckily found a Government outlet for local handicrafts. Since Goa is a popular tourist destination for foreigners, especially Europeans and Israelis, there are vendors from every part of India selling their handicrafts here. However, we were interested only in Goan-made handicrafts and arts. We found interesting stuff made of sea-shells, coconut shells and jute. We also bought a bunch of paintings made on wall-tiles. Finally, we stopped to pick up the mandatory packets of famous Goan cashews from Zanty's for friends and family. Since it was past lunch time by the time we drove back to our resort, we took our driver's recommendation and had lunch at Fisherman's Wharf which is a restaurant located on the bank of the river within walking distance of the Leela. 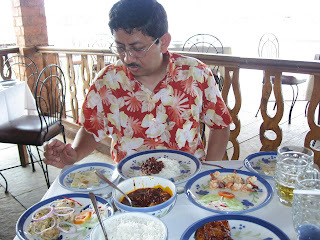 We ordered a variety of fish and chicken dishes and washed them down with chilled beer. Though the day was now humid and hot, we enjoyed our spicy lunch as we watched the fishing boats go about their daily routine on the far bank. Among the five-star resorts in Goa I have stayed in, I think the Park Hyatt had the most interesting rooms, while the Taj Aguada had the best food and the Radission White Sands the best swimming pool. The Casa de Goa has the best 'local' Portuguese feel while the best beach is at the Leela. On the day we were checking out, we woke up to the pitter, patter of rain outside. The monsoons had finally come to Goa; and, what perfect timing! Again a very readable report from your trip and also including a bit of history - an important part of the world history I should say! Thanks for sharing this trip with us in a very interesting way! Gorgeous pink. I'm ready to go to Goa, just from reading your words here. @rennyba: Thanks Renny! I was fascinated by your recent descriptions of the Crab Hunt and Hot Tub experience in Norway. Thanks for the tour. I've always wanted to visit India. 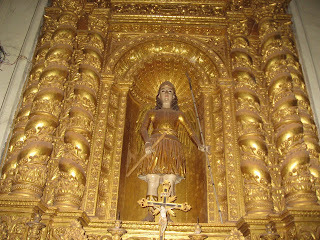 Goa's a great destination, with Portuguese and Indian cultures blended to perfection. What a wonderful place - you are truly blessed to visit. Thanks. @harekrishnaji, kyh, mo: Thanks for visiting and leaving comments. @illusionaire: And I would love to visit Mizoram someday. That's one part of the country that I have never travelled to. 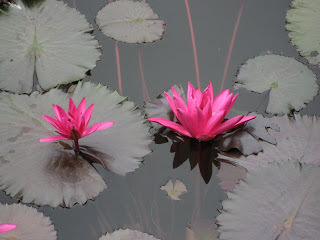 BTW, the flower in the picture is a lotus. I love the first picture of the flowers! Thanks for the short History lesson... the place does look like old Portuguese cities! @Zhu: I have seen Portugal only through pictures. I still have a lot of area to cover in Europe. I am going to Goa this Christmas, and I am so excited after reading all your posts on your vacations to Goa. I needed to check where is the state run handicraft shop which you found, as even I am keen on getting just Goan handicrafts. The first picture looks a lot like th cover of "the god of small things". lovely picture!! @shikha: Now that you mention it... :) These ones are pictures I took at the Leela hotel. 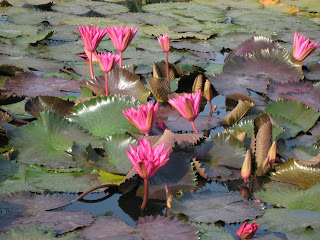 They have a bunch of ponds with lotus growing in them.